My leap into the firebreak dug by Mike Heath at the Christian Civic League was sudden and unexpected. In the late summer of 2001, I was among the great grey masses of lawyers, accountants, and clerical workers in Manhattan who have a cup of coffee each morning and then march off to work with robotic precision. I trudged along in a somewhat sorrowful spirit, having lost my young wife to illness one year before. In that first beautiful week of September, no one guessed that the sky would soon fall in. On Tuesday, September 11th, I looked out my door at the Twin Towers for the last time. Returning home two days later, I saw that all that remained of the buildings was a column of white smoke ascending into the sky. 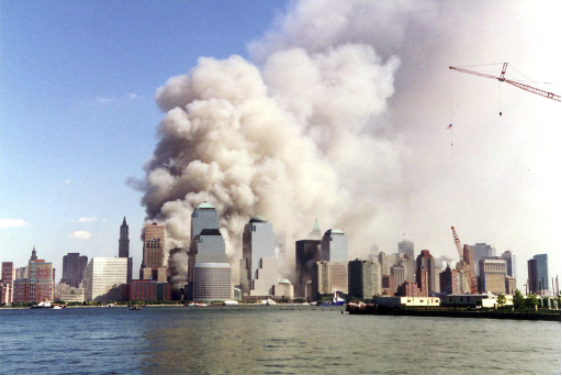 My recollection of all the buildings shredded like long strips of green metallic paper; of piles of ashes and billowing clouds of whitish-grey dust; of a friend barely escaping the collapsing North Tower; and of an acquaintance burned alive by cascading jet fuel, will add little to the accounts which can be found elsewhere. Out of all the terror, I remember most the rows upon rows of photos – thousands of them – of missing victims being sought by their families. Savages intent on murder had passed through Maine in the black of night to attack New York City. And like all demons, they bore the marks of night and fire. Alarmed by the attack, I was soon to make the journey in the opposite direction, back home to Maine. Returning home, I encountered a gaudy and raucous Gay Pride parade in Portland. The size of the parade astounded me; and it was the memory of the attack on St. Patrick’s Cathedral in New York by radical homosexual activists, and the sudden fear that I had not yet escaped the evils of the big city that made me cry out – quite without thinking – “Sodomites! You will bring down the wrath of God on Maine!” That is an opinion shared by many, but few are willing to say it. There would be no outrunning the evil which is the homosexual rights movement; and there could be no compromise, no capitulation, and no surrender. To fight back I contacted the Christian Civic League of Maine and offered my services. I was surprised and gratified to receive an invitation from Mike Heath to become the editor of the League’s online newspaper, The RECORD. Throughout all of the political campaigns, I remained an observer rather than a participant; and my reminiscences will necessarily omit the details pertaining to that aspect of the League’s effort. If one is to battle a dragon, one must find the proper armor; and once the armor is obtained, one must fight with single-minded determination. The armor I needed was the shield of faith and the sword of truth; and these I purchased at the cost of all my worldly goods. I watched my possessions pass out of my hands without any regret. All I owned was given to friends or donated; and at the very moment I watched my last possessions pass through the door of kindly neighbors, I saw for the first time — displayed on the wall of their living room — a life-size painting of Francis of Assisi. That sight has consoled me and confirmed me in my decision down to this very day. I made the journey to Augusta like a vagabond, with my clothes and a few good books packed loosely in a duffle bag, with no place to stay, and shoes that pinched and blistered my feet. Through the kindness of friends, I stayed for a while at the home of pro-life activists. I am especially indebted to one Catholic family for putting me up in their home for several days; and I am a bit embarrassed that I never found the occasion to thank or repay them properly. When money ran low during my stay in Augusta, I ate at a soup kitchen, learning to be grateful for a small portion of mashed potatoes, a hot dog, and whatever dessert was at hand. Toiletries I obtained from a homeless shelter and food bank; and I recall that on one occasion I was much pleased to receive a bag filled with small bars of soap. For a while I rented living quarters at the League headquarters, which gave me a phone, a desk, and best of all, a large and amply-filled bookshelf. At the end of my stay at the League, I stayed for two weeks at what is best called a rather dilapidated flophouse. My conversations with the broken, the homeless, the castaways, the mentally ill, and the convicts who were for a short time my neighbors proved to be far more rewarding than my contacts with the new leadership of the League. These men I quickly came to dislike as proud, presumptuous, and Pharisaical. Their manner of speech was at all times guided by the two worst aspects of the American character, a glib superficiality of thought, combined with a constant need for social approval. My plummeting fall in status proved to be my salvation. The dross of pride was purged from my heart; and I was learning to love my neighbor as myself. Shortly thereafter, I received a call to return home to care for my disabled son. Being by nature introverted, I misjudged Mike Heath on our first meeting. I did not warm to his open and candid “Hail fellow, well met!” persona. But that which I uncharitably judged to be a character flaw was merely a requirement for his political work – a need for affability – and was not in keeping with his true personality. Over the years, I gained an appreciation of his character, and found him to possess an unsurpassed practical wisdom and nearly infallible political prudence. Of all persons I have ever met, Mike Heath is the easiest to misjudge. We always underestimate the strengths of those who oppose us; and in underestimating Mike Heath, the homosexual rights movement made a crucial mistake, as did those on our side who preferred to go on to different leadership. Mike Hein, who managed the daily operation of the League, was a by-the-book administrator who possessed great strength of character, and an indefatigable fighting spirit. He was also a man of profound good will; and he treated all visitors who came to the League with great charity and true sincerity. Mike always found the right tactic to hit the homosexual rights movement hard, and he hit them again and again.